St. Raphael’s is a WCEA accredited school under the Archdiocese of Los Angeles. 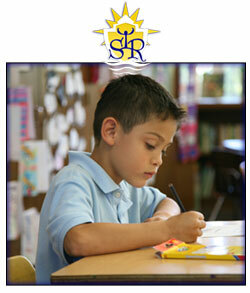 St. Raphael School is committed to the intellectual, social, emotional, physical and spiritual development of each child. The Gospel values guide all learning and instruction. St. Raphael School is a close community providing numerous opportunities for faith formation and focuses on service to our local community. St. Raphael School was founded when God answered a Daughter of Charity's prayer. To this day, our mission is consistent with that of our founding Sisters: to educate all children in preschool through eighth grade in mind, body and spirit by imparting the values of Jesus through a rigorous curriculum, devoted faculty and an actively involved parent community. St. Raphael School provides phenomenal educational programs in a safe, caring and inclusive environment. Our Catholic faith is embedded in all content areas and we focus our lessons on the intellectual, social, emotional, physical and spiritual development of each child, preparing them to be lifelong learners. Our curriculum is rigorous and is taught by caring, dedicated, and highly qualified educators. St. Raphael School is committed to striving to empower all students to strive for excellence while learning to live and adjust with this ever-changing, technologically diverse world.